It’s been a pretty good year for the beautiful game, what with Russia hosting the World Cup during the summer. And with the Premier League already up and running, the appetite for football has never been stronger. You would think then, that if you were the developers of a football title, now would be a really good time to put out the best version yet of your game, to attract new players to your franchise. Or not, as seems to be the case with Konami’s release of this year’s iteration of Pro Evolution Soccer. We should start by saying that competition is good, even in a David and Goliath scenario that Konami find themselves in yearly with EA’s annual offering. But despite this being a glorious year for the real game, very little appears to have changed in Konami’s. 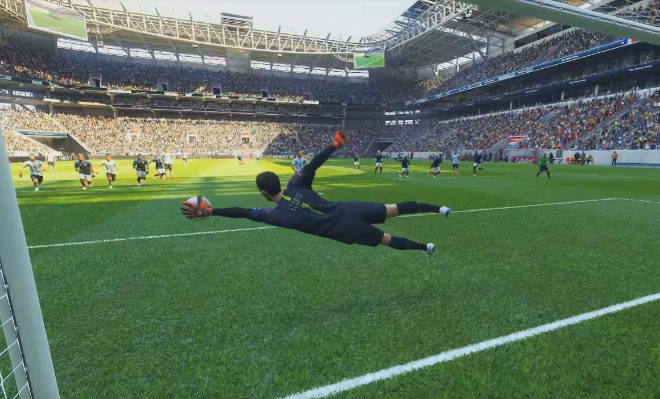 Instead of a complete overhaul, PES 19 has just had a touch up. As soon as you fire up the disc, you could easily be mistaken for playing last year’s version. A major gripe – still – is the interface. It is one of the ugliest known to gaming kind; it’s blocky, dated and the complete opposite of being intuitive. It’s as if Konami have had massive research done regarding their consumers, and all the data returned clearly identifies them as being technically blind. And as the saying goes, if it’s broke, don’t fix it. I'm 'ere 'cause they paid me shed loads. Nuff said. And once you’ve figured out how to get into the game, very little has changed there either. Master League is the main draw, if you enjoying playing teams with silly made up names that is. As per, we chose the team closest to Notts Forest, because we’re suckers that way. We like the ability of getting promoted to the English League 1, which although doesn’t sound too premier, is. But for some reason, we found most of our opponents unbeatable, so maybe someone decide to turn the challenge up one. If they did, we hate them for it. And since when has Daniel Sturridge played in League 2? We then ventured into Legend mode, after all, who doesn’t want to be one of those guys, right? This is where you can either play as an existing player, or create your own, and play as part of a team, as opposed to controlling all members of the team. As you play as a solo player, the angle is changed so that you are playing into the screen, instead of left to right. We haven’t had a problem playing this way before, after all it’s something that FIFA has used too, but the cameras feel off here. After a while playing, we found ourselves feeling a tad car sick, which isn’t ideal. So much so that we won’t be going down that career road again. it looks impressive, just don't tell them I glued the ball to my glove! Everything about PES19 is akin to stale cabbage, yep, it’s that unappealing. Even commentators Peter Drury and Jim Began are thawed out of annual cryogenic sleep to deliver the same old blurgh. The disappointment is compounded by the fact that the game itself plays like a treat. The speed of the game is certainly more favourable to the studdery FIFA and the animations are easy on the eye. And we have to confess, we scored the best goal we’ve ever scored (thank you Mr Gareth Bale in an Arsenal shirt) in a video game, with a bicycle kick at that. But possibly the worst crime against humanity this version commits is the omission of the conveyor belt of balls; now when you hire an agent to find you a player, he just turns up without any element of a 1970’s game show whatsoever. Sacrilege! Even the evil EA realised that the game remain stagnant at its peril; after all it introduced a story mode, which the world thought was a silly idea, but the world was wrong. And don’t get us started on the addiction that is Fifa Ultimate Team. Even without the lucrative league licenses, PES has shown in the past that it could compete with sparkly gameplay. But now players want more, and if the franchise is unwilling to evolve, not only will it remain in FIFA’s shadow, it will kick too many aimless balls out of the park, to the point where no-one will care to go and pick it up and take it home with them.